Step 1 Prepare grape leaves as mentioned above and set aside. Be sure to identify any damaged leaves (ones with rips or holes) and set them aside. Step 3 Slightly grease a medium size heavy cooking pot or Dutch oven and line the bottom with a few large grape leaves; Be sure to use the damaged leaves this layering step. This step is used to make sure that the stuffed grape leaves don’t get burned. For extra protection and flavoring, add a layer of thickly sliced tomatoes if desired (optional). You will use this pot to place the grape leaves in as you roll them. Step 4 Prepare clean work space or a large cutting board. Take one grape leaf and set on your cutting board, vein side up, with the center or wider part of the leaf toward you (this would be the side where the short stem was). Step 5 Using a measuring tablespoon, scoop a heaping portion of the stuffing and place in the center of the grape leaf (the part of the leaf closest to you). Step 6 Starting from the bottom right and left sides, fold those sides of the leaf to cover the mix and then roll once to tuck. Step 7 Take the left and right sides again folding them in and roll the rest of the way, tucking leaf sides in as you need to. Step 8 Your goal is to have each grape leaf rolled tightly enough without hanging pieces. Step 9 Layer grape leaves tightly together in the cooking pot. Add the beef broth at this point. 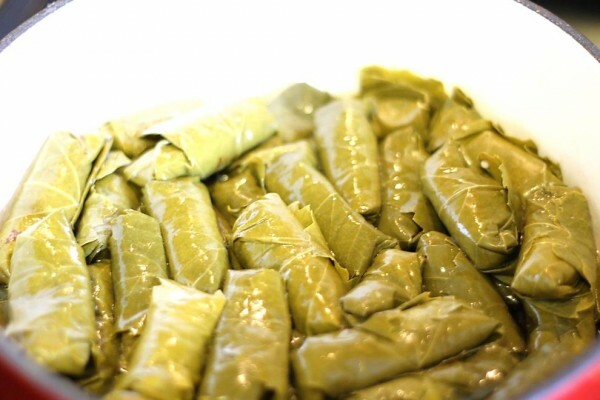 Weigh down the grape leaves with a small plate or bowl, this keeps leaves tightly together for the first few minutes of cooking to prevent unrolling. Step 10 Cook on high heat for about 15 minutes or until liquid reduces to half. Turn heat to low and remove the plate or bowl. Step 11 Now cover the pot with its own lid and cook on low for about 45 minutes or until done. Step 12 Serve with a side of plain yogurt for dipping.